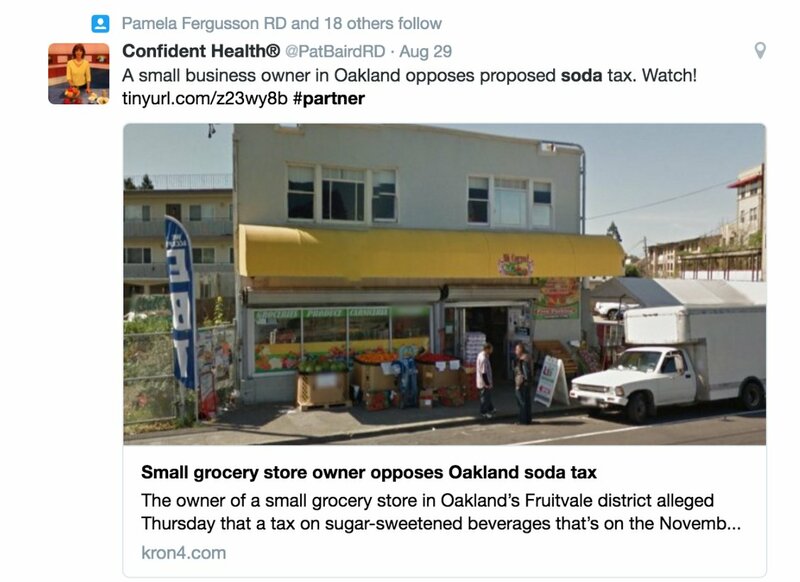 When registered dietitians like Roseanne Rust, Sylvia Klinger, Carol Berg Sloane tweet about proposed taxes on sugary drinks and claim that these will be used to impose "stealth tax" on other food, promoting the anti-soda-tax group Cart Choice (funded by Coke) they're reflecting the deeply held views of the Coca-Cola company and its industry body, the American Beverage Association -- and amazingly enough, they all take money from Coke or the ABA. Coke has a longstanding practice of paying dietitians to tout the benefits of drinking high-sugar beverages (a practice that independent scientists universally consider to be unhealthy), but the dietitians tweeting on Coke's behalf now are being especially lax about their financial ties to the company -- while some disclose that they are making "sponsored" tweets, they don't say who's sponsoring them. Ninjas for Health have created Twitter follow-lists of Coke-funded dietitians and front organizations, and by reading their streams, it's easy to see that they're all getting their talking points from the same source. So when a group of dietitians suddenly began offering their opinions on the #sodatax hashtag on Twitter this week, I got a little suspicious. Soda taxes are a strategy dietitians should (and do) support in order to decrease soda consumption and promote healthy options. Yet these dietitians were all posting content against the soda tax, including the industry talking point that a soda tax is a grocery tax. That’s just a coincidence right?